Sending children through university is a major financial commitment for any parent to undertake, so they should be fully aware of the financial implications and be confident that they can afford the fees throughout the selected term. Mr and Mrs Shah live in the Far East and have one son aged 3. Mr Shah is 36 years old and is an engineer and Mrs Shah is 32 and is a teacher. Taking everything into account they calculate that current costs could be in the region of USD56,000 for the first year. Armed with this information, they contact their financial adviser to discuss their options. 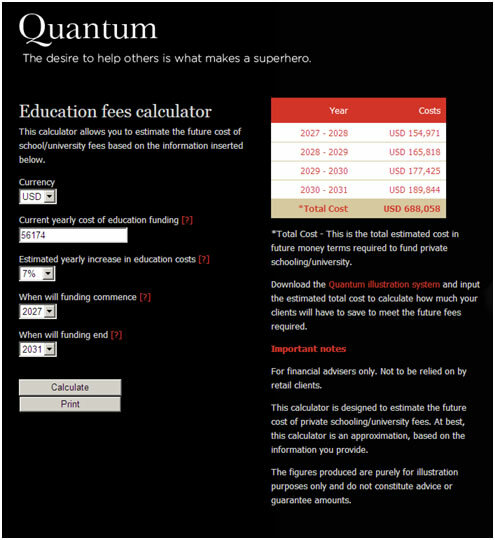 Their adviser has suggested that they use Quantum to build up an education fund to pay for these fees when they become due. In addition, both Mr and Mrs Shah accept that the costs of funding a university education for their son will continue to increase each year, so with their advisers help, agree that an annual increase of 7% is a reasonable assumption to make. Using the information provided, their adviser calculates what the future costs could be when their son is ready to start university by using the Education fees calculator. The results produced show that the total estimated cost could be over USD688,000. Using the Quantum illustration system, a monthly premium of USD2,510 over 15 years is required to meet these estimated costs assuming a growth rate of 5% per year. The figures produced in this case study assume that the university expenses increase at a constant rate each year. In reality, annual increases if any are prone to variance and future increases cannot be predicted. If your clients have children, they need to know their onions.